According to the Counterpoint Research report, Star India’s Hotstar is reigning the online video streaming market with 75 million subscribers, followed by Viacom18’s Voot that has 15 million subscribers. Amazon’s Prime Video is in the third position with 11 million subscribers, while SonyLiv and Netflix are ranked fourth and fifth, respectively, with about 5 million subscribers each. The list comprises of two hybrid revenue models (Hotstar and Sony LIV), two subscription revenue models (Prime Video and Netflix), and one advertisement-based player ( Voot). The report also reveals that the Indians still largely prefer free or ad-supported streaming platforms. 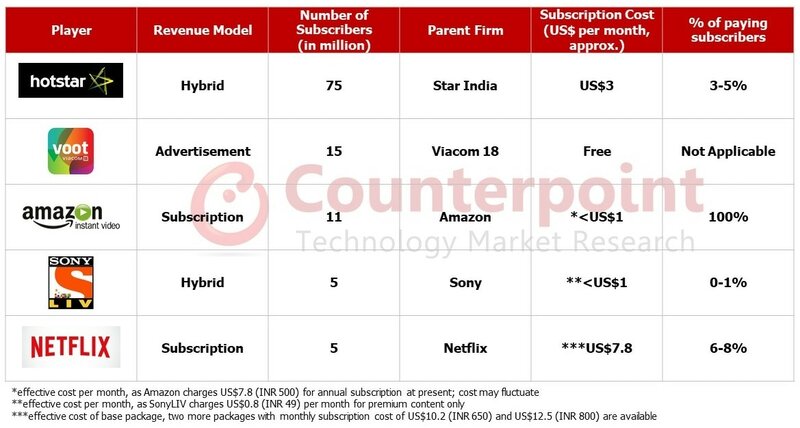 For instance, only about 2-3 percent of the total subscriber base actually pays for services on Hotstar while about 6 percent of the subscriber base of Netflix utilises the paid subscription – the rest take advantage of the ‘free first month’ offer. Amazon Prime Video, on the other hand, has a 100 percent paid subscription base, owing to its ‘less than $1’ (roughly Rs. 64) monthly subscription cost. Notably, this figure was arrived at by dividing the Rs. 499 annual cost by 12, but, the annual Prime subscription has since been revised to Rs. 999 – making it roughly Rs. 83 a month, or over $1. Netflix has the highest subscription cost with a minimum plan of Rs. 500 per month.